A fundraising evening in aid of the St Vincent De Paul’s Refugee Fund, which will take place at Sandino’s Bar on Thursday 3rd December. 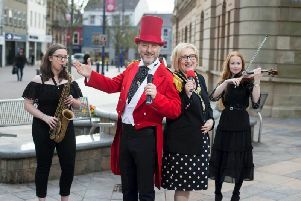 The auctioneer will be local SDLP councillor John Boyle and the auction will be followed by entertainment from singers Stephen McKeever, Susie Blue, fresh from supporting Bronagh Gallagher in Belfast, comedienne Fidelma Carolan and jazz, soul and funk band The Scenery. The evening has been organised by the Derry Refugee Solidarity Group. Tickets are £5 and can be purchased at Sandino’s from 8.30pm on Thursday 3rd December.